Sometimes I have to remind myself that I fell in love with my wife long before I knew she owned a string of ranch ponds crammed with big, dumb largemouth bass. I fell for Heather during a long bike ride — and I hate long bike rides — where my front brake came loose and rubbed against the wheel for miles. I have never been so thrashed in my life. “How could you not have noticed that the brake was rubbing against your wheel?” Heather said when the long, sweaty ordeal ended. “Well, I was busy noticing you,” I said. It was the right thing to say, and I really meant it. It was at least three or four months later that Heather took me on a tour of her orchard land. We drove through rows and rows of apple and cherry trees, turned a corner, and a pond — about 20 or so acres of willow-lined shores — came into view. “Are there fish in there?” I said. Love — for Heather and for her beautiful, unmolested, un-fished ponds — dizzily swam through my fish-addled brain. My head about exploded when I cast a fly rod popping bug onto that pond just before dark a week later. Largemouth bass sucked down that popper in boiling, swirling explosions. Heather, being a farmer, was back home resting up from a long day harvesting apples. I returned late that night, well after the late-summer sun had set and my saved steak dinner had cooled on the counter. I tenderly kissed her cheek. She woke up and smiled. I told her wild tales of big bass hammering my poppers until I fell asleep. By showing me her ponds, Heather turned me into a bass junkie for the second or third time in my life. I still loved wild trout the best, but my long, on-and-off affair with fly rod bass bloomed like a noxious weed into crazed angling bigamy. Fast forward a few years to right now. Heather, despite my romantic cluelessness after my first night on her ponds, has grown into a very good fly angler. Still, she was reluctant to cast a popper on her ponds, as that big, wind-resistant fly turned her beautiful casts into lurching, splashing, frustrating wrecks. She fished the ponds with a spinning rod and a hulking, gurgling Hula Popper plug. So, she never loved her ponds, and yes, the largemouth bass, quite as much as I did. Then, remarkably, she just started double-hauling when she cast her lumpish, ungainly Chubby Chernobyl fly to Redside rainbow trout whacking salmonflies. I didn’t even ask how this came about. I never mess with this kind of sacred mojo. A few weeks later, during a warm, balmy July evening, I ushered Heather onto the little 12-foot aluminum skiff I keep at the ponds. A dinner picnic of cold beer, crisp fried chicken and creamy potato salad waited. 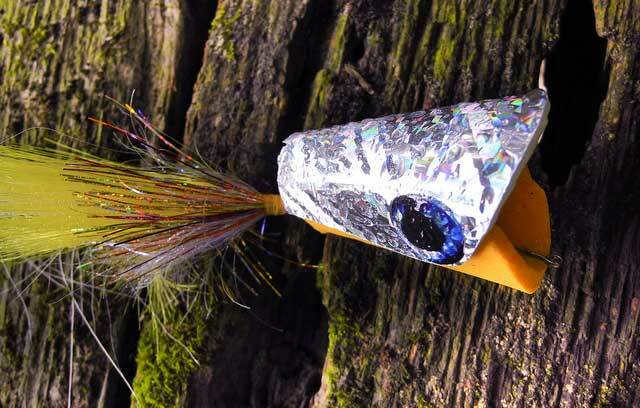 Fly rods loaded with bug-eyed, froggy poppers with quivering, dangling rubber legs poked from the bow. Heather’s two dogs — Berkeley and Cooper — also scrabbled onto the boat. Heather’s spinning rod and trusty Hula Popper lures were somehow left at home. My seduction skills had improved since that first night on the ponds a few years before. We ate, talked and enjoyed the evening as the boat drifted on the pond. The sun sunk toward the western sky, and the sinister swirls of feeding bass appeared near the weedbeds and under the pondside willows. Our quiet picnic came to a quick end. Heather picked up a 7-weight, and I picked up the oars. I eased the boat along the shoreline, and Heather, a little nervous, took a cast. The popper flopped to the surface a few feet from the boat. “Cast it like it’s a Chubby Chernobyl,” I said. Then some midsummer-night magic happened. – just inches from a stump. Heather gave the popper a twitch, and it went down in a boil. “@#^$#” Heather shouted as the bass flipped into the air and blew up the glassy water. A few minutes later, Heather posed with a fat, 4-pound bass — her first on the fly. Heather, now awash in confidence, fired casts under willow branches, along weedbeds and to stumps and reed edges. Greedy bass walloped the fly. I kept rowing and taking photos. More bass charged Heather’s popper, and I kept taking photos. Heather spotted one of my prime spots — a delicious, fishy mix of rock and tree stumps jutting out the water. “Row there,” she said crisply. The light slowly faded out of the west as Heather cast, popped and set the hook into a flurry of aggressive bass that charged out of that tangle of rock and waterlogged wood. I made three casts — all while Heather was admiring her latest catch — and landed a scrappy 10-incher. As I rowed the boat back to the shore, stars appeared in the dark sky. Later, after a shower, I slipped into bed. It was almost 11:30 pm. “I’m glad you had such a great night,” I said — and I really meant it. I waited a few moments — and tenderly kissed her cheek, but she was asleep.